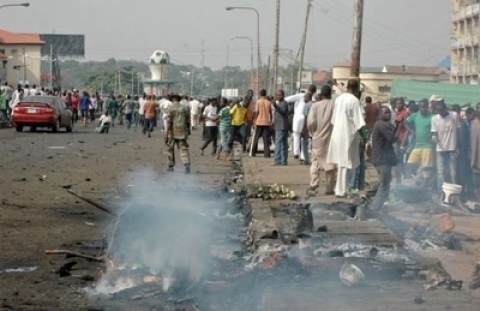 Gunmen Attack Potiskum Cattle Market In Yobe State, Killing 34 People-AFP | Life is short,have fun!!! An attack on a cattle market in northeastern city of Potiskum by gunmen armed with explosives has left at least 34 dead and the toll is likely to climb, an emergency source said on Thursday. “Thirty-four bodies were deposited at the hospital,” the official said on condition of anonymity of the attack late Wednesday in Potiskum because he was not authorised to speak publicly. He said the toll was likely to be more than 50 dead because families were also burying relatives’ bodies without bringing them to the hospital. A gang of gunmen with explosives have attacked a cattle market in the city of Potiskum, burning it down and leaving a number of people dead, residents and police said Thursday. The attack late Wednesday was said to be in reprisal for an incident earlier in the day, when the gang sought to rob the market but were fought off by traders who caught one of the attackers, a police source said. The man who was caught was doused in petrol and a tyre was placed around his neck before he was burnt to death, according to the source and residents. “There was an attack on Potiskum cattle market yesterday by suspected armed robbers who threw explosives and burnt down the market with all the livestock,” the police official said on condition of anonymity. Residents reported seeing bodies being taken away, but the number of casualties was unclear.